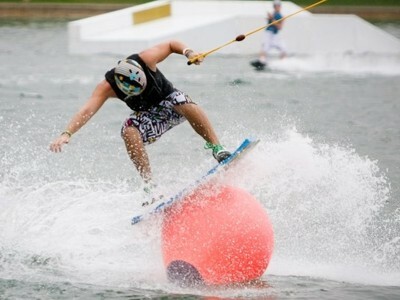 SKI360° is a cable waterskiing and wakeboarding company located at Singapore’s East Coast Park. Cable skiing or wakeboarding as its name implies, is waterskiing or wakeboarding where the participants are not pulled by a boat but by an overhead cable, very similar to a snow ski lift, but erected around the banks of a lake. The speed that the cable travels is the same as the boat speed in tournament waterskiing and wakeboarding, with a top speed of 58 kph. The cables runs counter clockwise around the lake and the participants are, very simply, hooked up to the cable on the move. Participants are not restricted to wakeboarding and waterskiing – people of all ages and abilities can slalom, trick ski, kneeboard, or even surf without the wave. Hourly passes and yearly memberships are available – visit the SKI360° website for more information. Singapore’s blessed with wonderful tropical weather all year round – perfect for waterskiing and wakeboarding at night! SKI360° is open until 11:45pm Friday & Saturday evenings.